Select a text that you wish to use in your final project and write a very brief blog post explaining why you chose it and how you might use it. Selected text: Levine, Mark. “Can a Papermaker Help to Save Civilization? – The New York Times.” New York Times Magazine 17 Feb. 2012. Web. 29 June 2017. Reasons: This article actually inspired my project topic. I knew that I wanted to focus on book arts, and handmade paper is often a part of this medium. I am personally interested in handmade paper as well and have taken classes on the topic. This article ties the art and craft of papermaking to our cultural history. This history (in both Eastern and Western countries) can easily incorporate teaching opportunities and help students to ask “historian’s questions.” This article serves as a jumping off point to other texts, including lesson plans and papermaking tutorials. It will be part of a larger bibliography to help both teachers and student see how handmade paper fits into history. This article also speaks to the need for authority in information sources. The subject of the interview is Timothy Barrett, a papermaker and former director of the Center for the Book at the University of Iowa. He is an established expert in the field. Although the New York Times Magazine is not a peer-reviewed journal, it is a respected publication and accessible to a wider audience. In addition to these kinds of texts, I will include several images and videos to help explain handmade paper and the process to create it. Helmut Brinkmann and Page Chichester at the Wall, Berlin. Possibly taken by an unknown passerby. 1990. This image is part of the collection Behind the Wall: Images of East Germany housed in Special Collections at George Mason University. Photographers Helmut Brinkmann and Page Chichester traveled throughout East Germany photographing people and cities during the period of German re-unification when the Berlin Wall was being torn down. 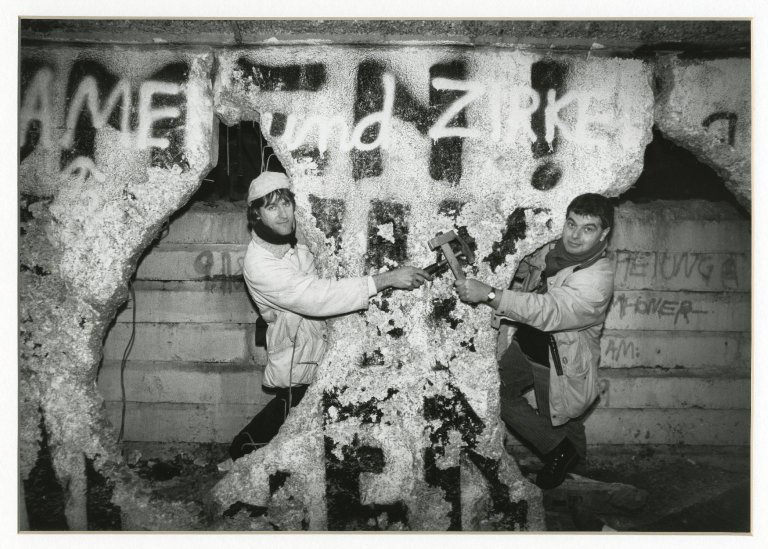 The image shows them taking part in what became a popular ritual–to break off part of the Berlin Wall as a souvenir. Read and compare the language used in the Finding Aid to the language used to promote the gallery exhibit. What differences stand out (if any)? What is the mission of each document is, and how is the language influenced by this mission? Looking specifically at the image above, what does it initially tell us about topics like German re-unification, the Cold War, communism, human nature, etc? Now select a book from the exhibit reading list. How does reading this book change or confirm your reading of the image? Examine the image above separately and in the context of the entire collection. Does your interpretation of the image change when examining it next to the other images? Do the photographs share similar purposes? Keep in mind that the image above was likely taken by a passerby and the other images were taken by the two photographers. What adjectives would you use to describe the images? Authentic? Sensationalized? Explain why you chose these words, keeping in mind lighting, camera angle, framing, and other photographic techniques. Now search for photographs of the Berlin Wall in the library database Artstor. Compare and contrast these photographs to those taken by Brinkmann and Chichester. Are there noticeable differences and similarities in the photographic techniques being used? How do all of these images compare to those in the textbook? Students will track the history of papermaking. Students be introduced to various exemplar handmade papers and learn to distinguish between them. Students will be able to define and use terminology unique to handmade paper in order to describe their work and the work of others.